Middle-class couples are working harder than ever. So why are they finding it more difficult to finance their homes, send their kids to college, and save toward retirement? Couples who are strapped for time and weighed down by costly fixed expenses need more than a personal finance pep talk: They need a plan. In The Big Payoff, CNBC correspondent Sharon Epperson lays out a nuts-and-bolts program that couples of all ages can use to realize their financial dreams. From stretching your budget and investing wisely in your home to protecting your family's money and building wealth over the years, The Big Payoff offers a concise bounty of precious information and practical steps toward financial wellness. Epperson begins by showing couples how to communicate better about money. She helps them realize that the same qualities needed to create a lasting relationship—understanding, compromise, and patience—are vital when it comes to building a secure financial future. Every important decision couples make, whether it's buying a home, having kids, changing jobs, or preparing for retirement, will inevitably involve a discussion about money, and Epperson teaches them how to handle finances with a cool hand while keeping the marriage vibrant and healthy. In addition, she empowers couples to take money matters into their own hands and shows them that by taking control of their finances, they can stop fretting about cash and start focusing on the important things in life. 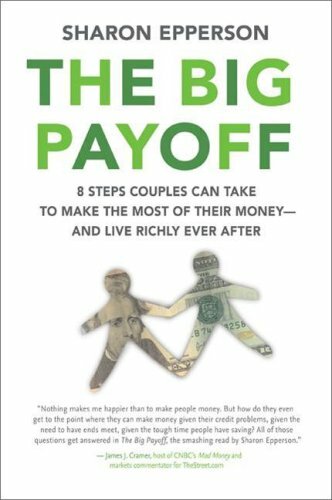 Each of the following chapters is designed to get partners talking and thinking about their financial life together. In eight easy-to-understand steps, Epperson unpacks the various options for saving money; creating emergency, retirement, and college savings plans; investing in a home; choosing the right life and health insurance; and drafting an estate plan. A wife and mother of two herself, Epperson knows a thing or two about the pitfalls of financial planning and doses her advice with plenty of humorous anecdotes, hard-earned experience, and down-to-earth language. Additionally, through helpful worksheets and exercises, The Big Payoff helps readers customize a plan that will work best for them and reap the most payback. It's never too late or too early to start, and now is the best time to start planning. Whether you are newlyweds or fast-approaching retirement, just starting a family or soon to be empty-nesters, this book is for you. After working hard to provide for your family, the reward of discovering your financial strength will be the peace of mind to enjoy your marriage, your family, and the rest of your lives together.